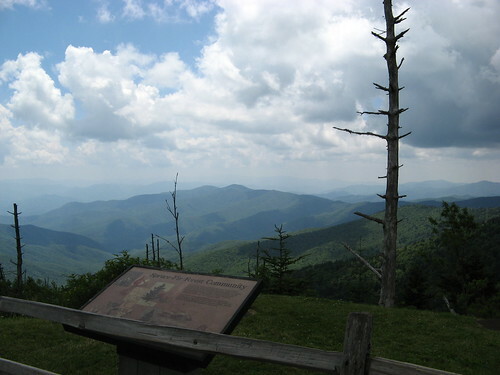 The Dome is more tourist destination than hiking destination: you can trek to it via the Appalachian Trail (a 14-mile out-and-back from the parking lot at Newfound Gap), but the parking lot a half-mile from the summit is an irresistible temptation. (Feeling more intrepid? 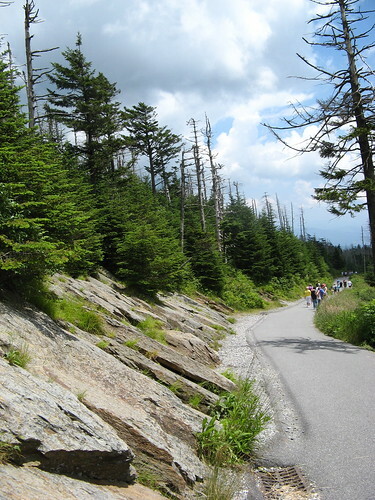 Check out the 16-mile South Beyond 6,000 route bagging Clingmans Dome and Mount Collins. There’s also a four-mile out-and-back to Andrews Bald from the parking lot). The path to the peak is wide and paved. It gains about 330 feet in a half-mile, roughly a 13 percent grade. Not ruinously steep, but far from flat, and all above 6,000 feet, so altitude will be an issue. Expect lots of people on the weekends, especially in the summer. The road to the top is closed in the winter from December through March, which makes it a prime cross-country skiing destination (as long as there’s snow). 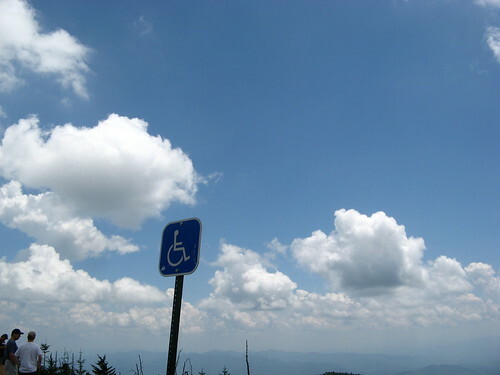 The best thing about Clingmans Dome is the view, so we might as well get right to it. 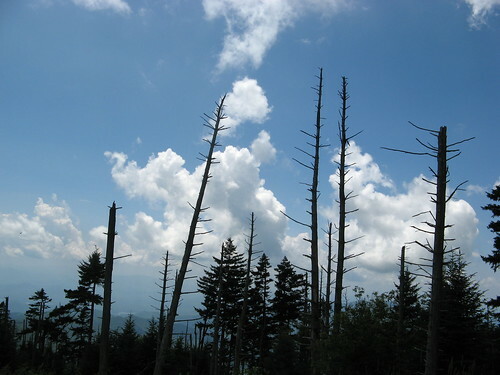 Dead Fraser firs haunt the landscape across the Smokies, victims of the balsam woolly adelgid, a parasitic insect that feeds on the trees’ sap, blocking the flow of moisture and nutrients. I prefer trees that die of old age rather than human folly, but there’s no denying their photogenic, uh, nature. 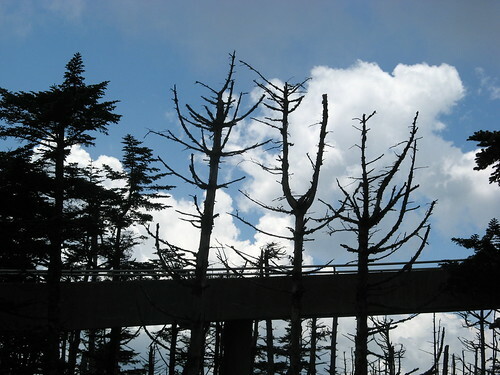 Ramp to the viewing tower atop Clingmans Dome. Looking down from the viewing tower. 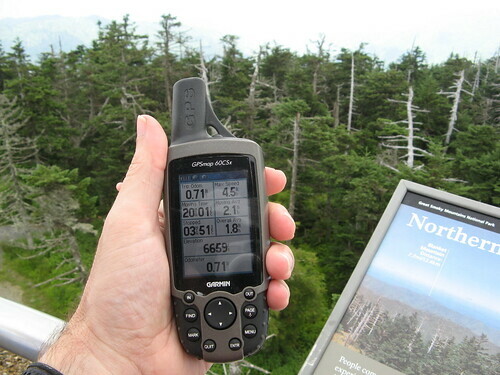 My shiny new GPS unit takes a reading 16 feet higher than the official elevation of 6,643 feet; note this was taken from the viewing tower — 50 feet up — so it’s actually 34 feet too low. Ain’t it cool to be a geek? 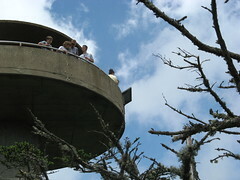 A look at the observation tower, for those who’ve never seen it. The path to the top looks like this. 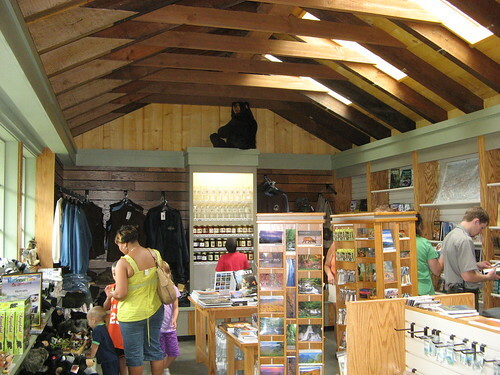 Here’s a look inside the visitors center. More towering vistas. Actually this is from the parking lot, proving you don’t have to walk to the top to get a good view. It’s better up there, of course, but really, not that much better. This image struck me for some reason. Other vital accomplishment from this outing: Drove through Gatlinburg and Pigeon forge, wondering why invasive predators never seem to feed on tourist traps. Must be there’s too much competition. I still remember the first time I saw the Smokies after visiting the Knoxville World’s Fair in 1982 (scary: going on 30 years ago). The hills and clouds were strangely seductive to an Illinois flatlander; I always wanted to come back. The one consolation I drew from my profession vaporizing and our little two-person-and-one-cat family moving across the continent to hotter climes with far fewer hiking trails was this: at least we’d be near the Smokies. Safe to say I’ll be back soon; it’s a four-hour drive past many fine hiking opportunities to get there, but it’s like anyplace in Big Nature: the gravity is relentless. Thanks for taking me back to my old stomping grounds. 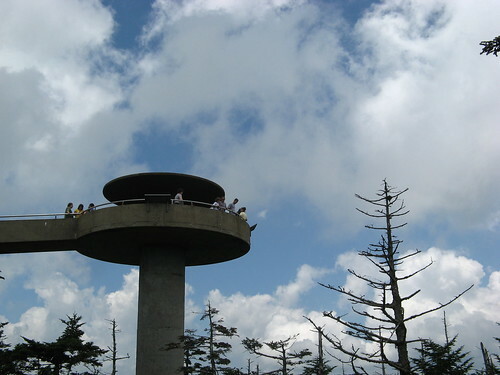 I bicycled up Clingman’s Dome a few times, sometimes starting in Knoxville, back in the ’70s. 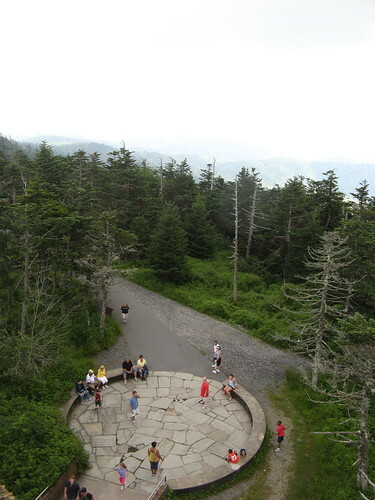 I agree that Clingman’s can be congested with tourists, but it is still a great view up there. Nice hiking blog. 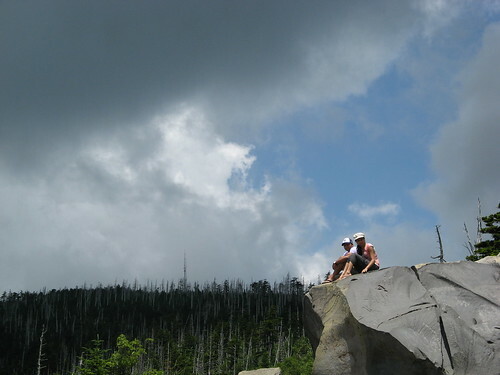 Thanks Daniel… loved your gallery of the Smokies. You should check into that South Over Sixthousand thing. Its pretty cool thing to try and accomplish. I have quite a few under my belt. I know I should … just wish we had more hills to train on here in the flatlands; that kinda climb really requires creating some muscle memory (after 40 this is defined as “memories of the time when I had muscle). My wife and I just did this one a little over a week ago and had a similar take on it. I bet xc skiing the road in the winter would be awesome!